Am späten Nachmittag konnten ca. 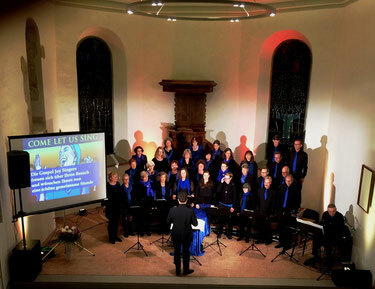 100 Besucher in der evangelischen Kirche in Bürglen unser erstes Konzert in der Reihe Come let us sing erleben. Neben dem Zuhören hinterliess auch das Mitmachen bei einer Body-Percussion zu E-Lah, das Zuschauen bei den Bewegungschoreographien und das Mitsingen des Kumbayah und des Titelsongs "Come Let us sing" bewegende Eindrücke. Morgen abend geht es nun zur zweiten Station nach Altnau. I do not even know how I stopped up here, but I thought this submit used to be great. I don't understand who you might be however certainly you are going to a well-known blogger in the event you aren't already. Cheers! What's up to every one, the contents present at this web site are in fact amazing for people experience, well, keep up the good work fellows. When I originally commented I seem to have clicked on the -Notify me when new comments are added- checkbox and now every time a comment is added I receive 4 emails with the exact same comment. Perhaps there is a way you can remove me from that service? Cheers! My coder is trying to persuade me to move to .net from PHP. I have always disliked the idea because of the expenses. But he's tryiong none the less. I've been using Movable-type on various websites for about a year and am nervous about switching to another platform. I have heard fantastic things about blogengine.net. Is there a way I can transfer all my wordpress posts into it? Any kind of help would be greatly appreciated!